Offering a fantastic range of affordable accommodation, Aurora Alice Springs is centrally located between the Todd River and Todd Mall. Surrounded by a great range of shops and the busy restaurant precinct, the hotel enjoys a great range of onsite facilities and is close to a range of major attractions. Offering self-catering villa accommodation in the heart of Alice Springs' shopping and dining precinct, Desert Palms Alice Springs features an excellent range of onsite facilities set within a tropical oasis. 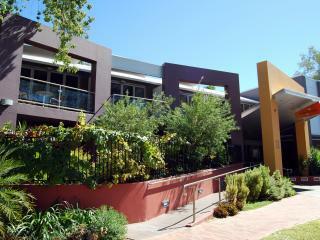 Close to a range of popular attractions, the resort is also right next door to the Alice Springs Golf Course. Offering affordable accommodation and an excellent range of amenities and onsite facilities, Diplomat Motel is conveniently located directly opposite the shopping and dining hub of City Mall and within minutes of popular attractions such as Alice Springs Desert Park, Lasseters Casino and the Aboriginal Art and Cultural Centre. Combining resort style accommodation with the unique atmosphere of the Australian outback, DoubleTree by Hilton Alice Springs offers a relaxing Red Centre holiday set against the stunning MacDonnell Ranges. Home to a great range of onsite facilities, the hotel is also just minutes from attractions and is next to an 18-hole golf course. Surrounded by native Australian bushland, Ibis Styles Alice Springs Oasis offers affordable accommodation in a relaxing location by the Todd River. Located within walking distance of the main town of Alice Springs, the hotel enjoys a great range of onsite facilities and is close to major attractions including the MacDonnell Ranges. Located by the Todd River, Mercure Alice Springs Resort offers well-appointed accommodation with a relaxed atmosphere and traditional outback ambiance. Featuring a great range of amenities and onsite facilities, the hotel is just minutes from the main hub of town and a number of activities and attractions.